The Model 5300 cooking controller provides flexibility for industrial cooking and baking systems. 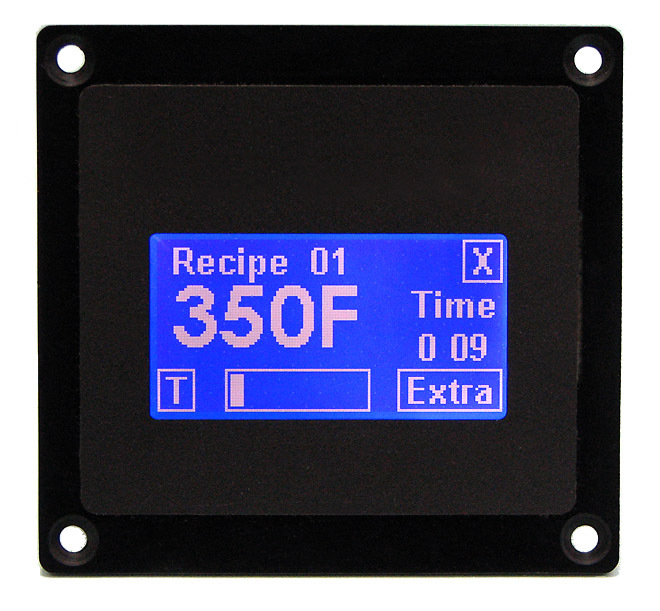 It incorporates a high-contrast blue and white LCD display with an analog touchscreen for all user inputs, relay and solid state heater control outputs, circulating fan relay output, and two 100 Ohm RTD temperature sensor inputs one for the cooking control probe and the other for an optional product temperature probe. An integral high-output beeper is used to confirm user touchpad presses and is configurable for short or long beep patterns indicating the end of the cook cycle, thereby easing the differentiation between installations with multiple controllers. An additional solid state output can be used to drive an external 12V DC lamp to indicate the conclusion of the cooking cycle for pass-thru ovens. The controller incorporates 15 cooking recipes which can be configured with a text name for enhanced user readability, preheat temperature, cooking temperature, cooking time, holding temperature, and cook to temperature. The cooking recipes and basic configuration are protected with a configurable four digit passcode with an additional factory level passcode. The factory passcode is used to access a service screen used for confirmation of functionality upon installation in the factory or the field. An eight position DIP switch is used to determine the heating output used, control hysteresis, availability of the product probe and cook to temperature functions, and the extra cook time available for real-time extension of the cooking time. Temperature Input Two inputs, one for cooking control, one for optional product temperature measurement. 100 Ohm RTD, Din 385 curve. Probe shield connections provided. Measurement Accuracy ±5°F from 150°F to 400°F. Unit self-calibrates upon power up and each time the controller goes from OFF mode to recipe list. Accuracy is for input circuitry only, add probe error for total measurement accuracy. Temperature Calibration ON/OFF control with selectable hysteresis values from 1°F to 10°F. Selected output energized until control probe reaches setpoint plus hysteresis value, off until temperature drops to setpoint minus hysteresis value. Construction 0.125" black polycarbonate front panel with polycarbonate overlay. Two printed circuit boards mounted behind front panel.